Submitted 3 months 1 week ago by bucks4life. Smith & Wesson’s new M&P SHIELD is a slim, concealable, lightweight, striker-fired polymer pistol. Available in 9mm, .40 S&W, and .45 ACP, the new M&P SHIELD features a slim design combined with the proven and trusted features found in the M&P Pistol Series. From the pistol’s easily concealed one-inch profile to its optimized 18-degree grip angle, the M&P SHIELD offers professional-grade features that provide consumers with simple operation and reliable performance. 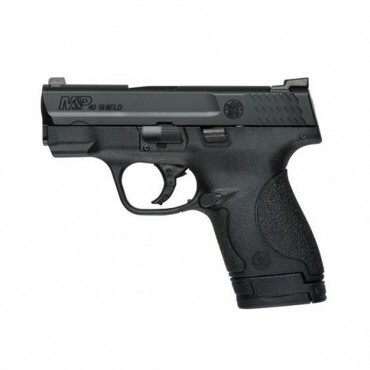 Chambered in .40 S&W for proven stopping power, the M&P SHIELD features a high-strength polymer frame with a black, durable, corrosion resistant finish, coated stainless steel slide and barrel. Standard with a 3.1-inch barrel, which contributes to an overall length of 6.1 inches and an unloaded weight of 19 ounces. For fast tracking and smooth target acquisition, the M&P SHIELD is standard with a 5.3-inch sight radius and has been enhanced with a short, consistent trigger pull measuring 6.5 pounds. Featuring a quick and audible reset made possible by the striker-fired action, the M&P SHIELD allows multiple rounds to be placed on target both consistently and accurately.